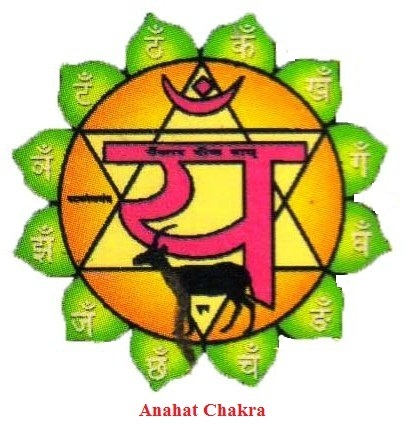 Anahat or Heart chakra : Anahat chakra is the 4th chakra in our body. The Anahat or heart chakra is situated on the inner wall of spinal chord directly behind the centre of chest i.e in the region of heart. Although this chakra is known as the heart chakra . Anahata is symbolized by a twelve petalled lotus and on each petal one the letters kam, kham, gam, gham, ngam, cham, chham, jam, jham, nyam, tam, tham is inscribed.The inner region is hexagonal in shape which represents the air element. This region is made up of two interlaced triangles which represents the union of the consciousness and creativity.Within this, the beeja mantra of anahata chakra is written i.e yam. It is associated with love and compassion. The Heart Chakra is of great importance in kundalini yoga as kundalini stays in this chakra for a long time. When you reaches anahata chakra only then you become a yogi. When the Kundalini pierces this chakra the aspirant gets control over his heart. Beej mantra of this chakra is the YAM. Once you reach anahata chakra, you will become beyond these empirical dimensions. Then you will realize that fate is of course real, but one can go totally beyond what it dictates. You will become the master of your own destiny. When anahata awakens, a feeling of unconditional and universal love for all will start developing in you. You will attain complete emotional balance and you will start listening the sounds coming from other realms. You may become a great poet or any other type of artist. You will develop clairvoyant/ clairaudience and psychokinetic ability, and you will be able to conquer anyone by the power of your love. With the awakening of this chakra one can hear with the inner ear the ten Anahat sounds including Om. During Heart chakra awakening, you may experience pain in chest and irregular functioning of heart, such as accelerated pulse. However rather than feeling ill, you will feel healthy and will require less sleep. This entry was posted in Smart astro guru, Yoga & Kundalini Shakti and tagged anahat chakra, Anahat chakra in kundalini shakti, beej mantra yam, Heart chakra, heart chakra in the body by R. N. Sharma. Bookmark the permalink. It¡¦s in point of fact a nice and helpful piece of information. I¡¦m happy that you shared this useful info with us. Please keep us up to date like this. Thank you for sharing. I simply had to thank you very much again. I do not know what I could possibly have gone through without the hints contributed by you directly on such a topic. This has been a frustrating difficulty in my opinion, however , noticing the well-written mode you solved it forced me to leap over delight. I am just grateful for this support and hope you realize what an amazing job you have been doing training many others thru your web blog. Most probably you haven’t got to know all of us.